Amidst reports that former Defence Secretary Gotabaya Rajapaksa is hoping to contest the next Presidential Election, Rajapaksa has justified the recent victory of US President Election Donald Trump on grounds that people took the decision because they are sick of career politicians. 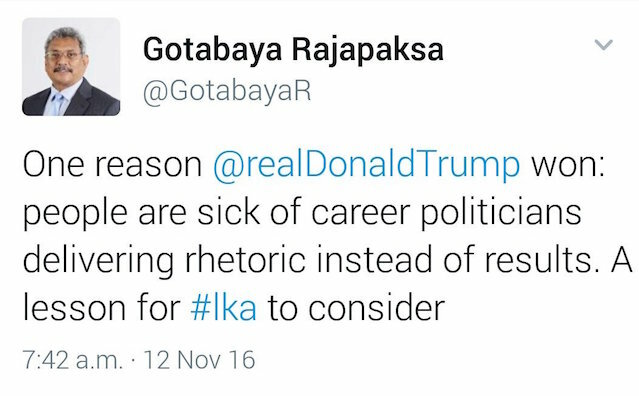 In a tweet on his official Twitter account, Rajapaksa said that Trump’s victory was a lesson for even Sri Lanka to consider. “One reason Donald Trump won: People are sick of career politicians delivering rhetoric instead of results. A lesson for Sri Lanka to consider,” he tweeted. In an interview with the Sunday Lankadeepa in October, Rajapaksa reportedly said that if he gets the opportunity to serve his country, then he will ‘certainly do so.’ However Rajapaksa had said that he had still not taken a final decision whether to enter politics, but added that there was around three and a half years’ time to take a decision on the matter.